The GyroTwister Xbeam is the training device that's addictive - in a positive sense: The latest tests from Germany show that training with the GyroTwister significantly improves your grip. It also trains your lower arms, upper arms and wrists in a fun and effective way. GyroTwister doesn´t operate using weights and springs like other types of training equipment, but by using the principle of gyro power. As a result, the power of GyroTwister is variable and always can be adjusted to the training condition of the user. The gyro energy generated amounts to around 10,000 rotations per minute, around 15 kilos or 33 pounds! How does the GyroTwister work? Imagine you´re holding a glass of ice cubes in your palm and you shake the ice around the inside wall of your glass. 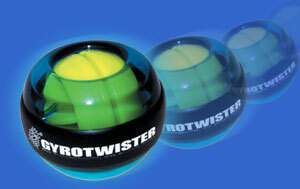 The GyroTwister works without batteries! You power it up using pure muscle power. Inside the device, you´ll find a 200 gram rotor - the heart of the GyroTwister. Once it´s set into motion, a rotation impulse starts up around the axis. Bike riders are familiar with this kind of impulse. If you get on a bike that´s not moving, you´ll fall over. But the faster you ride, the more stabile the bike becomes. To steer, more power has to be used as speeds increase. The rotor within the GyroTwister is able to build up stability In exactly the same way – through the moment of inertia (the gyrating mass is about 2 cm (1/2 inch) from the axis) and the rotation speed. The user can now try to tilt the rotor, while simultaneously turning the rotation axis, to create a moment when the rotor beings turning. The gyroscope reacts to this movement with an opposite motion in an attempt to straighten upright again. This power force is known as "precession". The opposite reaction movement is stronger than you might first think. The principle of precession is probably familiar to those who´ve tried to roll a bicycle or car tire down the street. At first the tire rolls straight and upright, then it turns to the left or right and then straight again, only to beginning turning all over again. In contrast to a tire being rolled along the street, the rotor inside the GyroTwister is guided in a circular motion. The GyroTwister can´t stand completely upright - instead, the precession is channeled by the guiding movement. The only "way out" for the rotor is to "roll away" from the guiding control, which increases the rotor speed. In the meantime, the user has tilted the body another quarter turn and the rotor continues its precession. This process continues on. The energy used by the user is converted into increased rotations for the rotor. This way it´s possible to speed up the rotor to 10,000 rotations per minute. The rotor is surrounded by gyrating movements which are 75 times higher than the actual weight of the rotor - that is, up to 15 kg or 33 pounds more! When the user no longer moves the rotor, the energy stored in the rotations is used by the friction. Every GyroTwister ordered is delivered with a GyroGrip Band. You can attach this rubber band around the GyroTwister to help grip it better, especially in case of hand perspiration during use. How the brandnew GyroTwister-Xbeam function, we´ll tell you here.